Professor Yang was released from jail today. He was sentenced to one and one-half years in jail with a suspended sentence but with two years probation. There can be no doubt that the international outcry on his behalf has helped spring him from the jailhouse. Sung-Hee Choi will go on trial June 10. She has ended her hunger strike and urges others to end their hunger strikes at this time. 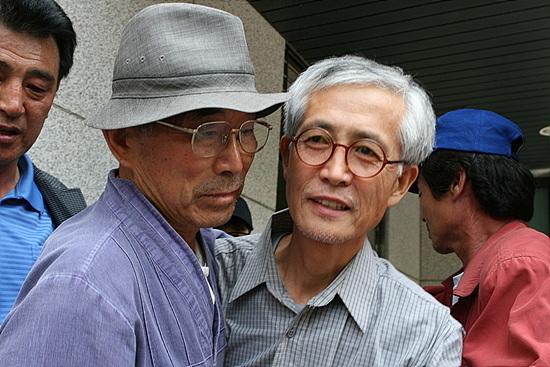 We are thrilled at the release of Professor Yang Yoon-Mo but deplore the strict conditions of a two year probation which is obviously intended to silence him politically. Our plan to send MacGregor Eddy to Jeju Island on behalf of the Global Network remains in place. She will be there for the June 10 trial of fellow Global Network board member Sung-Hee. People are already responding to our fund appeal to pay for her travel. We must not let our voices die down now. People must continue to spread news about Jeju Island and keep the heat on to halt the Navy base construction. American feminist activist Gloria Steinem visited the Gangjeong village in recent days along with a delegation of Korean women. I am certain that her visit was a huge lift to the villagers who have been working so hard for the past four years to bring this issue to the world’s attention. We are so proud of our friends in Gangjeong village and all the South Korean activists who have worked so hard to support them. It is an honor for us to work together in this good struggle for peace. Many NGOs in South Korea launched the “Korean National Committee against Jeju Naval Base Construction” on June 1. They plan to hold a press conference on June 8 and are requesting that international activists send a joint statement for the news conference. We will begin now to put that statement together. Let me know if your organization would like to be listed as a signatory on this basic statement of our support for the Gangjeong village struggle against the Navy base. We will keep you posted as we get more news about Yang and Sung-Hee. Thanks for keeping up with all this.